Don't be left out! Learn how you can support patients in your LANAP® protocol practice by performing laser dental procedures such as Laser Pocket Disinfection (LPD)™, treatment of Herpetic lesions and Apthous ulcers. Hygienists are also able to treat acute localized sensitivity with the PerioLase® MVP-7 FR Pulsed, Nd-YAG dental laser. These are just a few of the laser dental procedures that you may be able to perform in your office. Hygienists play a critical role in the successful treatment and maintenance of patients with periodontal disease both before and after the LANAP procedure. Many times it will be you that identifies the disease and educates your patients on their options including the LANAP protocol. As part of the LANAP clinical team, you will help with informed consent, and teaching your patients how to maximize their chances for bone building success with the LANAP protocol and hygiene maintenance with LPD. In many offices the hygienist can help the doctor identify the need for post operative occlusal adjustments that are key to successful periodontal treatment. 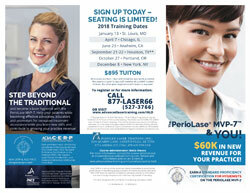 This course will open your eyes to the wonderful world of laser hygiene and allow you to truly be part of the gold standard of care for laser periodontitis treatment with the PerioLase MVP-7 and the LANAP protocol. Participants successfully completing the day and passing the exam will receive 8 AGD/PACE approved CE credits and Standard Proficiency Certification through the IALD. *Special Note for Texas Residents - Texas Board Regulations require a minimum of 12 Hours of Live Course training. This law went into effect on June 23rd of 2015. To be in compliance in the State of Texas, we've added a second day of training. This half day class will be held on the morning following our regularly scheduled full day courses in Texas. Please see below for information on the agenda and pricing. Advanced Half Day Course on the day following is $595.